I know how important it is to many women to understand what is in the products that they are applying to their skin, and using in their home. Cancer survivors, chemically sensitive or allergic women, those with allergies, some of which are fatal (eg, gluten), all have a deep desire to be educated, and to be able to trust the companies from which they are shopping for personal products. I hope that this library of information about our products will help you find the information and trust that you need to keep coming back. I’m always available for questions, so don’t hesitate to email me via our contact page. My own story includes a long journey of education on celiac disease, chemicals and sensitivity, in a country that has a totally unregulated cosmetics industry controlled by lobbyists and corporations. I hope Monave can be the antidote to the Big Beauty Brands, and be a place where women like me will feel at home. For the most recent articles, please visit our blog. Our philosophy is simple: We include ingredients that are either beneficial or benign that make our skin look softer and prettier, our eyes brighter, and our lips more smooth. We do not use ingredients whose sole purpose is to improve the look or texture of the product in the jar. That is simply not our mission. So if our liners look handmade, or our powders not so silky as Brand X, that’s okay with us! Protect their skin from sun damage and pollution. Rejuvenate and restore damaged skin, as well as keep it soft and hydrated. Avoid toxic or irritating ingredients, even natural ones. Create long-wearing, wearable cosmetic products that make beauty rituals simpler, and fewer for busy women. The ingredients that we exclude are: dyes, lakes, carmine, synthetic fragrance, talc, bismuth oxychloride, petroleum derivatives, sodium lauryl/laureth sulfate, methylparaben, propylparaben, UREA, and others. For more information on these and other issues, please visit www.allnaturalbeauty.us, and references the articles written by vendors and formulators in the online library. With the exception of the Breakfast Bar (Oatmeal Soap), all of Monave’s line is completely gluten-free. With the exception of our oatmeal soap, Monave’s line of cosmetics is completely gluten-free. The owner, Teporah Bilezikian, is a celiac, and has carefully researched cosmetics ingredients and removed all traces of gluten. The primary source of gluten Monave Mineral Makeup was Vitamin E from Wheat Germ Oil. Monave began using rice-based Vitamin E in 2008 and the liner is now completely gluten-free with the exception of the oatmeal soap. The handcrafter that makes Monave’s skincare has a dedicated gluten-free facility, so there is no cross-contamination. Loose Mineral Foundation: Titanium dioxide, iron oxides, mica, ultramarine blue, May Contain: zinc oxide, silica. Loose Mineral Concealer-Foundation: zinc oxide, titanium dioxide, micronized zinc oxide, iron oxides, ultramarine blue, mica, kaolin clay, may contain serecite, silica. Liquid Matte Foundation: Distilled Water, Hazelnut Oil, jojoba oil, sun-bleached beeswax, Sodium Borate, Xanthan Gum, Essential Oils of Listea Cubeba, Ylang Ylang and Myrrh. Color:Mica, titanium dioxide, iron oxides, ultramarine blue, May Contain: zinc oxide, micronized zinc oxide, silica, kaolin clay. Cream Foundation: Organic sunflower oil, Organic Soybean Oil, Jojoba, Purified Water, Beeswax, Organic Aloe Leaf Juice, Chammomile Extract Vitamin E (rice-based), Borax, Essential Oils of Rosewood, Lavender, Wildcrafted Rosemary. Mica, titanium dioxide, iron oxides, ultramarine blue, May Contain: zinc oxide, micronized zinc oxide, silica kaolin clay. Unscented Cream Foundation: Organic Sunflower Oil, Soybean Oil, Jojoba, Purified Water, Beeswax, Borax, Vitamin E (rice-based), Wildcrafted Rosemary. Mica, titanium dioxide, iron oxides, ultramarine blue, May Contain: zinc oxide, micronized zinc oxide, silica, kaolin clay. Moisture Mousse Foundation: Rose Hydrosol, organic jojoba, apricot kernel oil, organic shea butter, sunbleached beexwax, borax, soy lecithin, lavender hydrosol, xanthan gum, essential oils of rosewood, lavender and rose. Mica, titanium dioxide, iron oxides, ultramarine blue, May Contain: zinc oxide, micronized zinc oxide, silica. N.B Sodium Salt of the Stearic Acid Ester of Lactyl lactate is vegetable derived and comes from the food industry where it is used as food emulsifier. Cetearyl Glucoside is made from alcohol and glucose. Vegan Cream to Powder Concealer: Organic meadow foam sea oil, caster oil, fractionated cocnut oil, candellila wax, jojobo oil, silica, serecite, vit. e (rice based). Color Ingredients: Mica, titanium dioxide, iron oxides, ultramarine blue. May Contain: zinc oxide, silica. Vegan Concealer Crayons: Olive Squalene Oil, Meadowfoam Seed Oil, Carnauba Wax, Jojoba Oil, Candelilla Wax, Fractionated Coconut Oil, Japan Wax, Red Raspberry Seed Oil. Color ingredients: Titanium dioxide, iron oxides, mica, ultramarine blue, May Contain: zinc oxide, silica. Foundation Luster Adjusters: zinc oxide, titanium dioxide, serecite, iron oxides, mica, ultramarine blue. Blushes, Bronzers and Illuminizers: Mica, iron oxides, titanium dioxide, may contain ultramarine blue, zinc oxide, manganese violet (#211, 213, 214, 215, 216, 218, 219, 220). Economy Blush: Zinc Oxide, Serecite, Silica, Iron Oxides, Ultramarine blue, May contain manganese violet (Medium Dark Warm, Medium Dark Cool, Medium Neutral, Medium Cool, Light Warm, Light Neutral, Light Cool), Mica. Ultra-Mattes for eyes: Serecite, iron oxides, titanium dioxide, kaolin clay; may contain ultramarine blue, silica, zinc oxide. 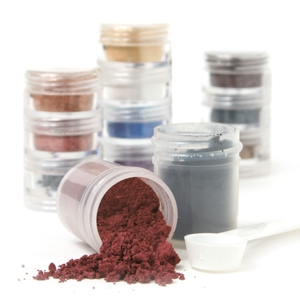 Versatile Mineral Powders: Mica, Iron Oxides, Titanium Dioxide. May contain ferric ferrocyanide (#21, 22, 23, 63, 63, 64, 65, 66, 67, 3), Manganese Violet (#15, 178, Chiffon, Purple Punter, Violet Violation). Cream to Powder: Base Ingredients: Jojoba oil, beeswax, candelilla wax, cornstarch, castor oil, rice-based vitamin E.
Color Ingredients: Mica, Titanium Dioxide, Iron Oxides. Versatile Eye Pastels (vegan): Olive Squalene Oil, Meadowfoam Seed Oil, Carnauba Wax, Jojoba Oil, Candelilla Wax, Fractionated Coconut Oil, Japan Wax, Red Raspberry Seed Oil. Color Ingredients: Mica, Iron Oxides, Titanium Dioxide. May contain ferric ferrocyanide (#21, 22, 23, 63, 63, 64, 65, 66, 67, 3), Manganese Violet (#15, 178, Chiffon, Purple Punter). Eye, Lip Liners and Concealer Pencils: Cold-pressed Jojoba Oil, Castor Oil, beeswax, candelilla wax, vitamin E (rice based), Mica, Iron Oxides, Titanium Dioxide. Bright blue, Smokey Blue, Grape, Turquoise: contain ferric ferrocyanide. May contain Manganese Violet (Grape). Vegan Eye Liners (Black, Espresso, Deep Plum): Organic Jojoba Oil, Organic Hemp Seed Oil, Organic Shea Butter, Wild Harvested Candellia Wax, Organic Carnuba Wax, Vitamin E (Non GMO sunflower seed derived), Mica, Iron Oxides, Titanium Dioxide. May contain Cold Pressed Meadowfoam Seed Oil (Espresso, Smoke), ferric ferrocyanide (Bright blue, Smokey Blue, and Grape), Manganese Violet (Grape). Natural Mascara: purified water, Vegetable glycerin, beeswax, copernicia cerifera (carnauba) wax, vegetable glyceryl stearate, lecithin, vegetable stearic acid, safflower oil, glycine soja (soybean) oil (and) aloe barbadensis leaf extract, simmondsia chinensis (jojoba) seed oil, silica, cellulose gum, tocopherol, xanthan gum, chamomilla recutita (matricaria) flower extract, rosemary) leaf extract, cucumis sativus (cucumber) fruit extract, phenoxyethanol. May contain: mica, titanium dioxide (CI 77891), iron oxides (CI 77491, 77492, 77480). Clear Potted Lip Gloss: Castor oil, organic coconut oil, beeswax, castor wax, soybean oil, vitamin e (rice- based), organic essential oil of sweet orange. Potted Lip Gloss: Organic castor oil, castor wax, organic carnauba, organic beeswax, organic orange oil Color ingredients: Mica, Iron Oxides, Titanium Dioxide, may contain Manganese Violet (#158, 169, 173, 178, 179, 180, 211, 218, 219, 220). Liquid Gloss: Base Ingredients (Old): Castor oil, organic coconut oil, sunbleached beeswax, castor wax, soybean oil, vitamin e, ( rice-based), Organic essential oil of sweet orange Color ingredients: Mica, Iron Oxides, Titanium Dioxide, may contain Manganese Violet (#158, 169, 173, 175, 178, 179, 180, 211, 218, 219, 220). Liquid Gloss: Base Ingredients (New): Castor Oil,Castor Wax, Beeswax, Meadowfoam Seed Oil, Carnauba Wax, Orange Essential Oil. Color ingredients: Mica, Iron Oxides, Titanium Dioxide, may contain Manganese Violet (#158, 169, 173, 175, 178, 179, 180, 211, 218, 219, 220). Lip Tints: Castor oil, organic coconut oil, sunbleached beeswax, castor wax, soybean oil, vitamin e (rice based), Organic essential oil of sweet orange, and alkanet root. Vegan Lip Glaze: Base Ingredients (New): Organic Castor Oil, Organic Coconut Oil, Organic Jojoba Oil, Organic Hemp Seed Oil, Castor Wax, Organic Carnauba Wax, Vitamine E (non-GMO sunflower seed derived). May contain Candellila wax, Organic Strawberry Extract, organic lime essential oil, organic cilantro essential oil. Color Ingredients: Mica, Iron Oxides, Titanium Dioxide, may contain Manganese Violet (#158, 169, 173, 175, 178, 179, 180, 211, 218, 219, 220). Vegan Lip Glaze: Base Ingredients (Old): Castor Oil, Castor Wax, Jojoba Oil, Carnauba Wax, Vitamine E (rice-based), Rasberry Oil. Color Ingredients: Mica, Iron Oxides, Titanium Dioxide, may contain Manganese Violet (#158, 169, 173, 175, 178, 179, 180, 211, 218, 219, 220). Vegan Lipstick: Base ingredients (Old): Cocoa Butter, Candelilla Wax, Castor Oil, Meadowfoam Seed Oil, Sesame Oil, Avocado Butter, Macademia Nut Oil, Vitamin E (rice- based). Color Ingredients: Mica, Iron Oxides, Titanium Dioxide, may contain Manganese Violet (#158, 169, 173, 178, 179, 180, 211, 218, 219, 220). Vegan Lipstick: Base ingredients (New): Lipstick Ingredients: Organic Castor Oil, Olive Squalene Oil, Organic Jojoba Oil, Organic Cocoa Butter, Simmondsia chinensis (Jojoba) Esters, Candelilla Wax, Carnauba Wax, Organic Pomegranate Seed CO2, Sea Buckthorn Berry CO2. Color Ingredients: Mica, Iron Oxides, Titanium Dioxide, may contain Manganese Violet (#158, 169, 173, 178, 179, 180, 211, 218, 219, 220). Vegan Rainbow Lip Lites: Base ingredients: Organic Castor Oil, Organic Coconut Oil, Organic Jojoba Oil, Organic Hemp Seed Oil, Castor Wax, Organic Strawberry Extract, Organic Carnauba Wax, Vitamine E (non-GMO sunflower seed derived). Color ingredients: Mica, Iron Oxides, Titanium Dioxide. Lip Creme Stix (Vegan): Olive Squalene Oil, Meadowfoam seed oil, Carnuba Wax, Jojoba oil, Candellia wax, Fractionated Coconut Oil, Japan Wax, Red Rasberry Seed Oil. May contain Titanium Dioxide and Iron oxides. Creamy Body Cleanser: Liquid soap made from Sunflower Oil and Coconut Oil, Distilled Water, Essential Oil of Lavender. May contain Mica and Titanium Dioxide. Green Clay Cleansing Bar: Green Clay, litsea cubeba Essential Oil. Lavender Cleansing Bar: Lavender Flowers, Lavender EO. Oatmeal Cleansing Bar: Vanilla-Infused Coconut Oil, Cinnamon Extract. Honey-Clay Cleanser: Kaolin Clay, Honey, Glycerin, Purified Water, Algae Extract, Potassium Sorbate, and Essential Oils of Lavender and Rosewood. Gentle Bamboo Honey Facial Polish: Kaolin Clay, Honey, Glycerin, Bamboo Powder, Purified Water, Algae Extract, Potassium Sorbate, and Essential Oils of Lavender and Rosewood. Grapefruit Mousse Cleanser: Purified Water, Saponified Oils of Coconut, Palm, Castor and Sunflower, Shea Butter, Stearic Acid, Grapefruit Seed Extract, Soy Protein, Sodium Borate (Borax), Titanium Dioxide and Essential Oil of Grapefruit. Rose Daily Moisture Cream: Rose Hydrosol, Lavender Hydrosol, Unrefined Shea Butter, Organic Jojoba Oil, Apricot Kernel Oil, Sunbleached Beeswax, Sodium Borate, Essential Oils of Rose, Rosewood, and Lavender. Oil-Control Humectant: Chammomile Hydrosol, Hazelnut Oil, Jojoba Oil, Unrefined Shea Butter, Xanthan Gum, Sunbleached beeswax, Sodium Borate, Essential Oils of Litsea Cubeba, Australian Tea Tree Oil, and Myrrh. Unscented Intensive Emollient Base: Organic Sunflower Oil, Soybean Oil, Jojoba, Unrefined Shea Butter, Purified Water, Beeswax, Sodium Borate, rice-based Vitamin E, Rosemary. Rosemary Tonic: Wildcrafted, Hand-distilled Rosemary Hydrosol with retained Rosemary Essential Oil. Our Rosemary is grown in the Sonoran desert and is especially potent as well as fragrant. Monave has an extensive line of vegan products. We are dedicated to promoting the ethical treatment of farm animals, as well as limiting the use of animals, by encouraging a plant-based diet, and educating consumers about hidden animal-sourced ingredients in products varying from home goods to cosmetics to even beer production. Animal testing is an abomination, and we hope that those who purchase animal based products support farms that engage in humane treatment of their livestock. Click here to read more about our Vegan products & Ingredients at Monave, as well as an extensive list of the vegan products that what we offer.